Give. Give again. Keep giving. Don’t stop. Don’t expect something in return, don’t calculate. Don’t calculate a return. Don’t financialize. Don’t compete. Don’t worry if it’s too much, or not enough. Give what you can. Maybe a bit more than you can. Keep giving. Give. Give again. Don’t stop. This is to give generously. Thank you, thanks. To receive a gift, whatever it is, with grace, with thanks, without need, fear of debt or obligation. This is to receive with generosity. To give generously is to socialize love. Don’t worry if others capitalize on your generosity. If they save, store, hoard or profit. Give more. Give much more. Give much, much more. Overwhelm capital with generosity. Confound those that calculate. Give. Generosity need not be scarce. It’s bountiful. Overwrite scarcity with abundance. Keep giving and receiving. This is radical generosity. Infinite giving, like creativity; it’s as generous as the sun. Generosity is archaic, it predates subjects, property and money, and is more powerful than the sum of those parts, much more powerful. Aristotle theorized generosity as a cultivated trait that guides virtuous men to give to others. To give the appropriate amount, to the appropriate person in the appropriate circumstances is the privilege of the virtuous man. It’s the root of Aristotle’s ethics. Christian ethics too. Aristotle economized generosity, and gave it as a property to the powerful. To powerful men. Can poor people be generous? Clearly. Women? Stupid question. Neither Aristotle, his ethics, nor the institutions founded on them, can control the transformational power of generosity. Give. Give again. Keep giving and receiving, don’t stop. Generosity doesn’t depend on the gender, or the social or financial status of the giver, or receiver. Or the thing given. Powerful men are frightened of generosity. Give. Give gifts generously. Keep giving. Give promiscuously. Frighten men. Don’t stop. Generosity cannot be economised. Receiving through obligation is not generous. Giving to those expecting a gift is not generous. Giving to those in need is not generous. Don’t give money. Giving money can never be generous. Money cancels relations between people. Giving money is charity, charity is middle-class giving, it’s the exercise of power not generosity. Give, give generously. Give again, keep giving. Don’t stop. If generosity is commodified, economized, contractual, politicized, or recognized as charity, or recognized at all, it ceases to be generous. There can be no political economy of generosity. That’s why men are frightened. Generosity is only possible if it goes unrecognized. It’s an impossibility. But don’t stop. Give. Give gifts generously. Anonymously. At night. Keep giving. Don’t worry about possibility or impossibility. Give generously, and don’t stop. The astonishing power of giving is crystallized by French sociologist Marcel Mauss’ in The Gift (1924). 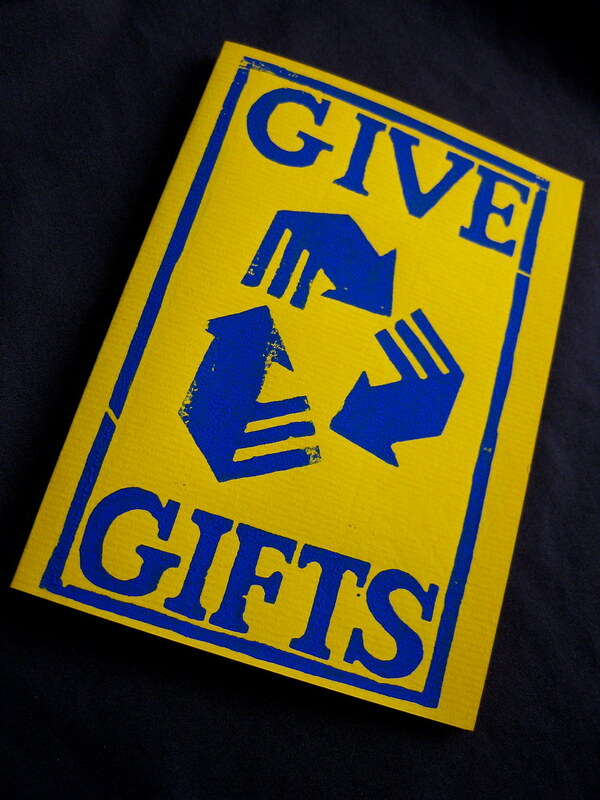 Mauss’ gift economy works like this; receiving a gift triggers the obligation to reciprocate; you reciprocate, the counter gift necessitates a return, and so on, and so on, endlessly. It’s a networked social contract. Giving gifts makes families, friends and communities. Giving also makes enemies. The unreciprocated gift is a debt. And a debt cannot be forgotten, or repaid, only deferred. Debt is deferred because of the temporality of the gift; gifts shift the present into the future, as debts recollect the past into the present. Sometimes debts span generations, continents, communities and nations. And if the debt cannot be forgotten, and it can never be forgotten, it turns vengeful and nurtures hatred; recipients are always beholden to the donor. Here lies the dark underbelly of ungenerous giving. Of charity, debt, obligation and enslavement. The ungenerous gift carries a terrible destructive power; it’s the Accursed Share of George Bataille. Give. Give gifts generously. Squander, and don’t stop. To give generously is to invest in the future. Generosity transacts love through time. You were born into these meshworks of generosity, giving and debt. There is no outside. And, unless you have learnt a religious observance, there is no original gift. Give gifts generously. Keep giving. Give precious things, give the most precious things, and give them to strangers. Like blood. Give blood. Give blood to strangers. Give life. Give love. Give love to strangers. Give. Keep giving. The traditional logic of the gift, presupposes an already constituted subject, the virtuous man, prior to the act of giving. The virtuous man is a sovereign individual, in possession of property. By giving or receiving, by deferring debt he establishes communal, contractual relations with others. Generosity is radically other. Its not a property, nor is it gendered, and its not in the eye of the beholder. It’s a collective, temporary evaluation, fleeting, explosive, and transformational. Generosity converts specific values, very valuable values, perhaps the most precious values, into a currency. Generosity embodies and distributes these values. And as such, generosity is always emergent, always a creative inter-subjective practice. Generosity creates and distributes a radical subjectivity. Generosity is our future, inhabit it. Give. Give generously, keep giving, and don’t stop. Don’t expect something in return, don’t calculate, quantify, and don’t financialize. Give and receive precious things, give the most precious things, and give them to strangers. Keep giving and receiving. Don’t stop. A version of Generosity was included in Ends Meet, a publication developed by Critical Writing students at the Royal College of Art. Take a look at related projects Capital or Give Gifts. Read an account of the See the 24 hour, seven day marathon event Truth is Concrete.